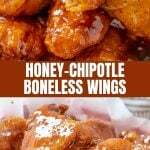 Honey Chipotle Boneless Wings with sweet, tangy, and spicy flavors you’ll love for a game day or party. 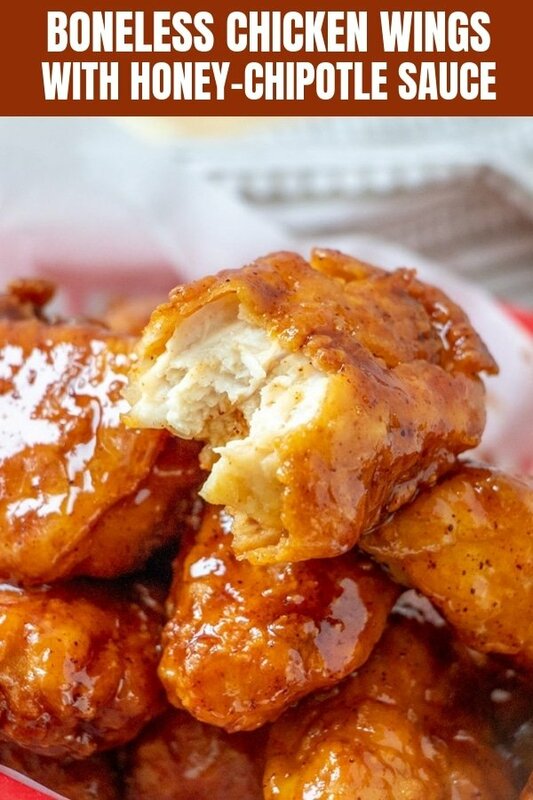 They’re sticky, saucy, and seriously addicting, they’re a guaranteed crowd pleaser! Buffalo Chicken wings are a classic appetizer that has remained popular over the years for a good reason. They’re finger-licking, lip-smacking amazing! 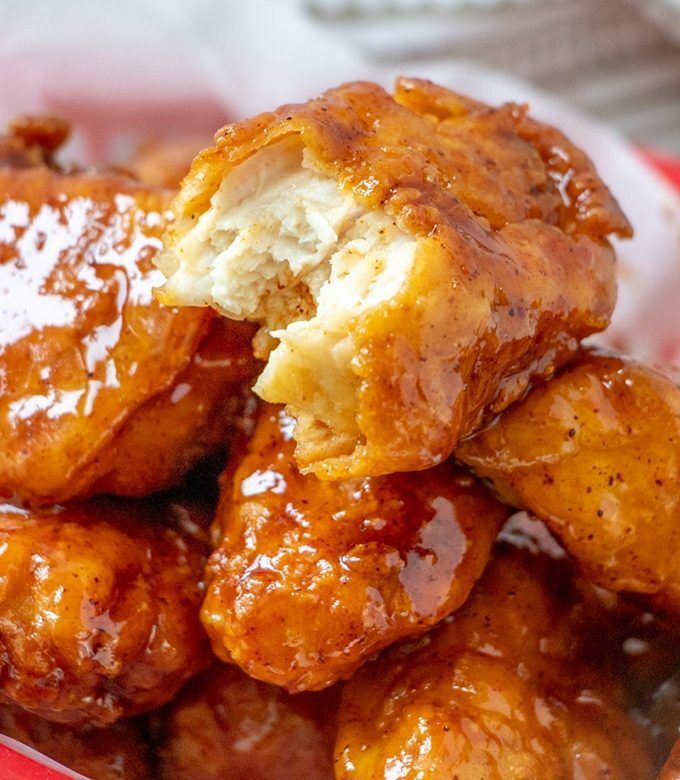 But although they’re without question delicious, I have to say these honey chipotle boneless wings would easily topple them off the top finger food list. 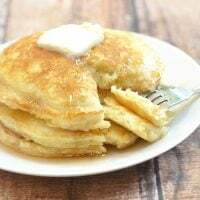 Sticky and saucy on the outside and moist and tender on the inside with a delicious medley of sweet, tangy, and spicy, you’d be hard-pressed to eat just one! 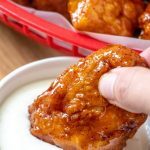 Are boneless chicken wings really wings? 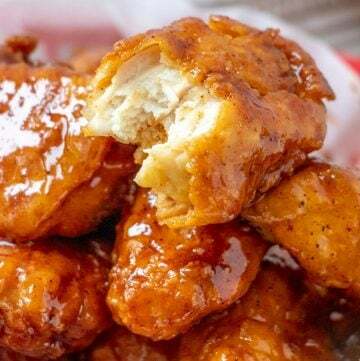 Here is a truth–> The first time I tried boneless wings, I really thought they were chicken wings that a cook painstakingly removed the bones from. I ate each piece, wondering how they were able to bundle the separated meat together into one solid piece. 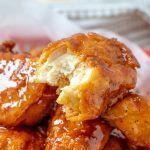 Of course, when I started to make them myself, I learned that what we call boneless wings are large chunks of chicken breasts that are breaded and sauced like their bone-in counterpart. 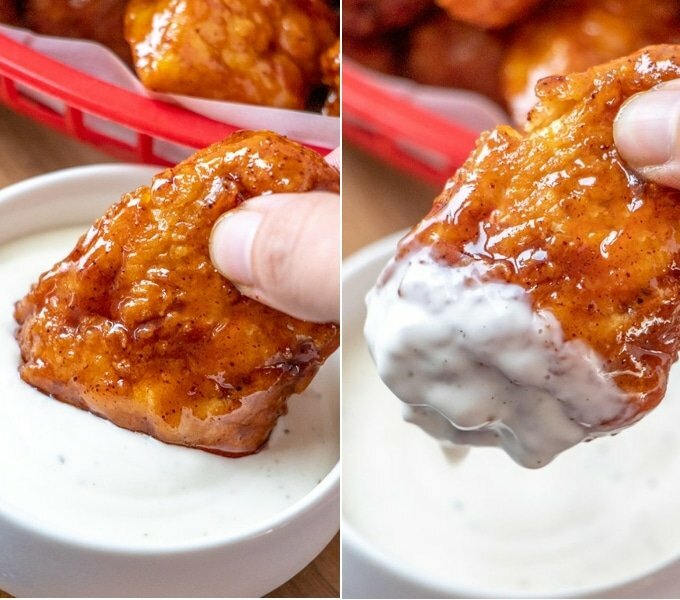 Although they do have nice, crisp edges, these boneless chicken wings are not ultra crunchy once they’re sauced but it’s still important to bread them properly for the best texture. To ensure the coating doesn’t fall apart, double dredge in flour and allow to rest or chill in the fridge for a few minutes before frying. 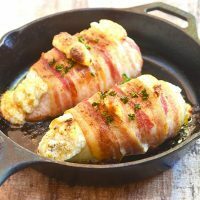 Try to cut the chicken breasts in uniform size to ensure even cooking. Use an oil with a high smoke point such as canola, corn, sunflower or peanut oil. The breaded wings are deep-fried so make sure to use enough oil. Fry at the optimal temperature range of 350 to 375 F. Too low and the breading will absorb a lot more grease and might fall apart. Too hot and the breading will burn/brown even before the chicken inside is sufficiently cooked. Do not overcrowd the pan to allow space for the chicken to cook properly. Fry in batches as needed and bring the temperature back to 350 F before adding the next round. 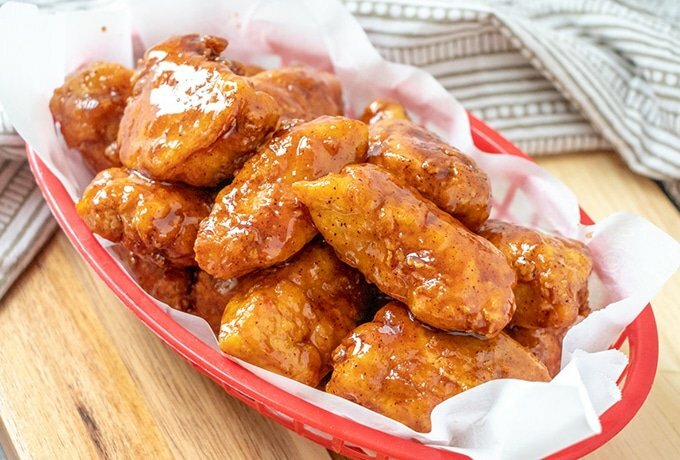 Drain the fried wings on a wire rack set on a baking sheet to catch oil drips and not on paper towels lest the escaping steam might make them soggy. 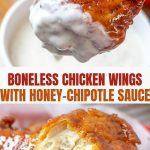 The chicken pieces are moist, tender, and tasty but the real heart of this recipe is the honey chipotle sauce. This stuff is so good, you’d want to put it on everything! It has so much flavor, I love to spoon it on piping hot steamed rice sans meat and call it a meal. 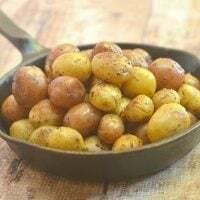 All you need to prepare this mother of all sauces is ketchup, honey, a few tablespoons of the adobo sauce chipotle peppers are packed in, vinegar, and a touch of butter. You can easily adjust measurements and make it less or more spicy, sweet or tangy. 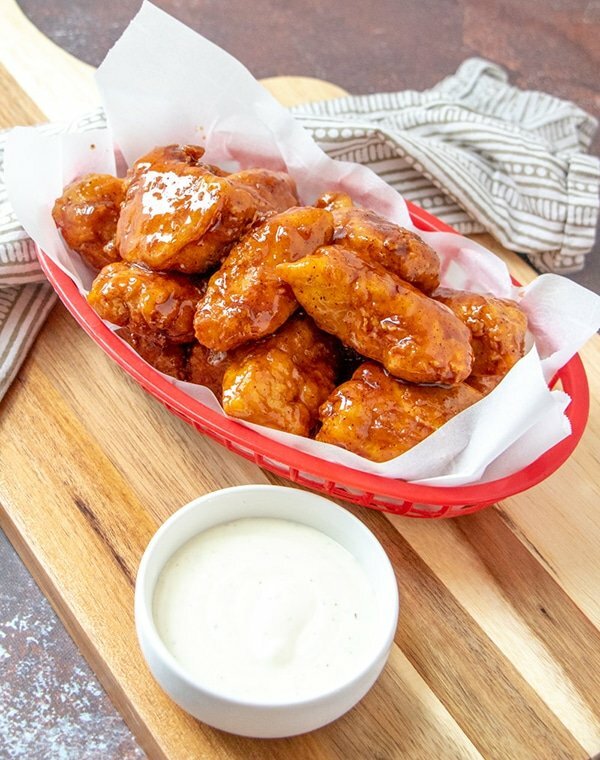 Serve these delectable wings with carrot and celery sticks for a side of fresh flavor and ranch or blue cheese dressing to cool down a bit of the heat. 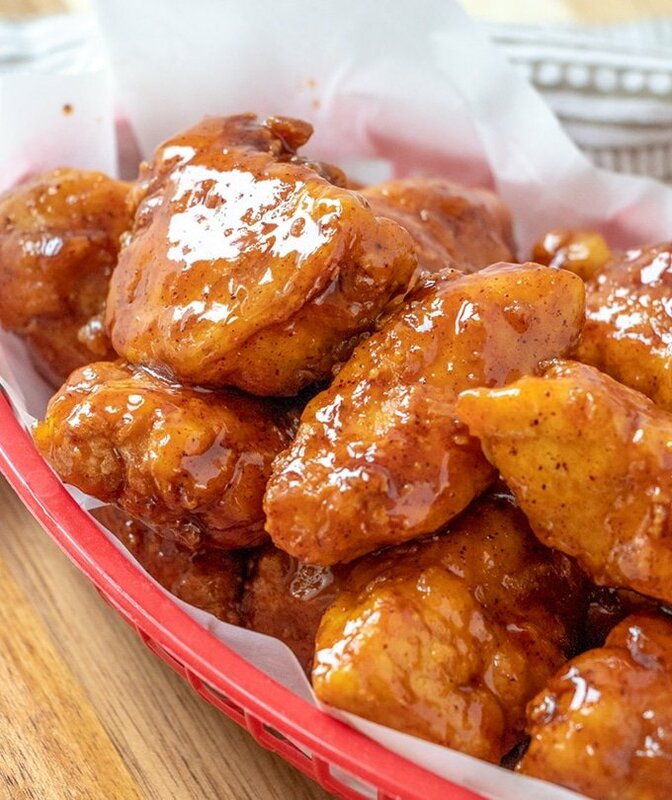 Honey Chipotle Boneless Wings with sweet, tangy, and spicy flavors you'll love for a game day or party. 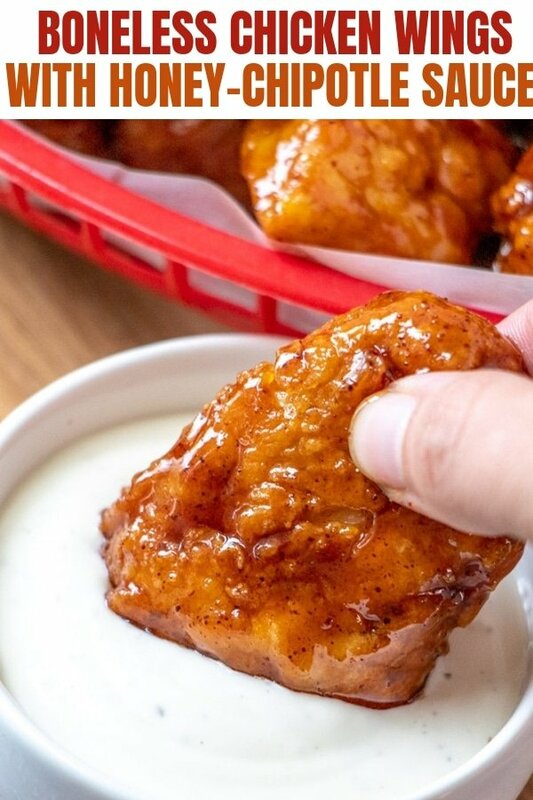 They're sticky, saucy, and seriously addicting, they're a guaranteed crowd pleaser! In a bowl, combine flour, salt, cayenne pepper, garlic powder, and paprika. 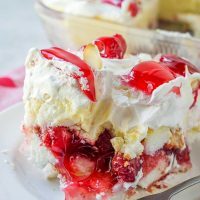 In a bowl, combine egg and milk and whisk until frothy. Dredge chicken in flour, dip in egg and then dredge in flour mixture to fully coat. Dredge again in flour, dip in the egg mixture and then dredge in flour mixture to double coat. Arrange in a single layer on a baking then and refrigerate for about 10 minutes to chill. In a deep pot, heat about 2 inches deep of oil to 350 F. Add chicken in batches and fry for about 5 to 6 minutes or until chicken is cooked through and breading is crisp and golden. Using a slotted spoon, remove from pan and drain on a wire rack. In a saucepan over medium heat, combine honey, ketchup, chipotle pepper sauce (or powder), vinegar, and butter. Stir until blended and simmer until thickened and heated. Dip crispy fried chicken pieces in the sauce and toss to coat. Serve immediately with ranch dressing.